Single-Part Epoxy Adhesives | Loxeal S.r.l. Single part epoxy resins are the highest performant adhesives as for mechanical, thermal and chemicals resistance. They cure by means of heating in a broad range of temperatures and cure time. The curing can be done using ovens, by convection or radiation, or by magnetic induction. When heated they can become fluid or not in order to offer quick and reliable solutions to designers. High viscosity single-part, epoxy adhesive, suitable for bonding metal surfaces, ferrites, ceramics as well as composite materials. It has been designed to be non-sagging, (even at elevated temperatures), allowing the product to be used in gaps and on vertical surfaces. Typical cure profile is in the range of +130°C/+150°C. Fast curing could be obtained by induction on Fe materials. It provides high impact, peeling and tensile strength. Structural single-part epoxy adhesive. Under curing conditions it becomes self-levelling and flows like solder giving rise to a silver-like surface appearance after curing. Typical cure profile is in the range of +130°C/+150°C, providing excellent adhesion to metal surfaces, aluminium, ferrites, ceramics as well as composite materials. Curing can be obtained alternatively by induction in few minutes on steel parts too. Loxeal 4580 is suitable also for metal fastenings replacing and for welding thanks to its elevated performances. High impact, peeling and tensile adhesive properties. Excellent resistance to vibration. Structural self-levelling single-part epoxy adhesive that polymerizes subjected to heat at +150°C in about 30 minutes, providing excellent adhesion to metal surfaces, aluminium, ferrites, ceramics as well as composite materials. Curing can be obtained alternatively by induction in few minutes on steel parts too. Loxeal 4620 is suitable also for metal fastenings replacing and for welding thanks to its elevated performances. High impact, peeling and tensile adhesive properties. Structural thixotropic single-part epoxy becoming fluid once subjected to heat. Typical cure profile is in the range of +120°C / +150°C, providing excellent adhesion to metal surfaces, aluminium, ferrites, ceramics as well as composite materials. Curing can be obtained alternatively by induction in few minutes on steel parts too. Loxeal 4680 is suitable also for metal fastenings replacing and for welding thanks to its elevated performances. 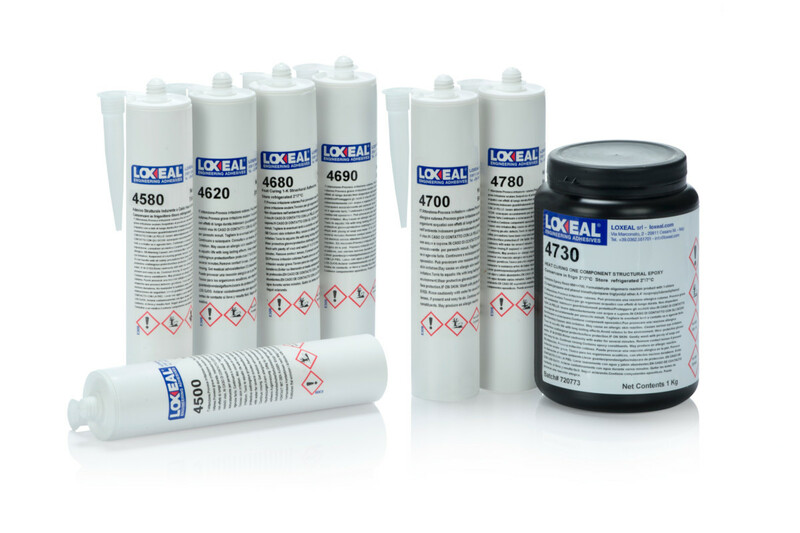 Loxeal 4690 is a single-part, epoxy adhesive, suitable for bonding metal surfaces and composite materials. Loxeal 4690 is also suitable for metal fastenings replacing and for welding thanks to its elevated performances. Structural self-levelling single-part epoxy adhesive that polymerizes subjected to heat at +120°C in about 15 minutes; curing can be obtained alternatively by induction in few minutes on steel parts too. Recommended to externally fix and seal pre-assembled components or to capsulate small details. Loxeal 4700 is suitable also for metal fastenings replacing and for welding thanks to its elevated performances. High impact, peeling and tensile adhesive properties. It provides excellent adhesion to metal surfaces, aluminium, ferrites, ceramics as well as composite materials. Curing is affected in the temperature range +130°/+ 150°C, or alternatively by induction in seconds on steel parts. It guarantees effective thermal conductivity with high bond strength. Suitable in application where heat dissipation is required, typically bonding of aluminium casted parts on ceramic manifolds. The cured adhesive has been designed to meet the fire retardency requirements of UL94 V-0.